We’ve been discussing theories about how to read poems, how to pause, what to do with line endings, etc. As you can imagine, I have a lot more to say about the topic. But don’t worry, like Silverstein’s little girl who ate the whale, we’ll tackle it in small bites. This is a busy couple of days for me, so if I don’t respond right away, I assure you I will as soon as I can, so let’s keep this discussion going. I’m interested in my readers’ thougths on this. Concrete poetry, or shaped poetry poses its own challenges, and can be subject to interpretation. 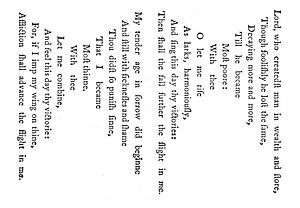 It seems to me that unless the listener has a copy of the poem in front of him or her, the elements of line and space in a shaped poem must be somehow interpreted in the voice of the one reading. Or could it be that such poetry is not meant to be read out loud? Hmm . . . I can’t swallow that myself, but bear with me; I’m still struggling with the concept of prose poems! Personally, I think my reading from earlier today is the weakest one from this National Poetry Month project, but that’s ok. It’s a learning experience for me as much as anything else. I was searching for other Swenson readings online and discovered this delightful reading by a creative young man on YouTube. I hope he doesn’t mind my sharing with you his reading of Swenson’s “Analysis of Baseball.” You can find the text of the poem at the Poetry Foundation site here. I love your concept! Frankly, I don’t listen to as much poetry as I should, and line breaks are one big challenge I have. Thank you! And it’s such a relief to find other poetry nerds… erm, I mean lovers online. Poetry lovers online, I should say, not just lovers online… That’s it. I’m for bed. Loving your work. I find the poems good and what you have to say very informative. Always happy to meet someone with a passion for poetry. I am digging your piece on concrete poetry; it is an interesting form of poetry and I think it falls on the reader on how it should be read out loud…good stuff man. Hey, thank you for chiming in. I really appreciate it. I am enjoying this poetry month more than ones previous, as I’m meeting a lot of great poegers– poetry bloggers. I just made that word up. Corny as hell, right?